My old friend Christian Barker – ex-Rake editor and general good egg – has a new project documenting some of the 10 style commandments of his famous friends and stylists. He published my thoughts today, and you can see the full article here. The site is called Men’s Top Tens and also includes insights from the likes of Luciano Barbera, Raymond Chu and Ston Tantraporn. You can follow the discussion on My 10 style commandments by entering your email address in the box below. You will then receive an email every time a new comment is added. These will also contain a link to a page where you can stop the alerts, and remove all of your related data from the site. Hi Simon, trying to click through on the links you’ve provided but just get a blank screen – have tried in both Safari and Chrome but no luck on either. Any ideas? Strange, they work for me. Try copying and pasting the link? Thank you for this post! I really enjoy reading all of them! Strikingly enough is the importance of fit to you all! However, conspicously evaded are shoes, no mention, aside Luciano Barbera’s view on how trousers should … kiss shoes! This is one for posterity …Love it! Hated this. Sounds like it should be in GQ. There are guys out there that are still surprised when they dress well, yet some good-looking guy in jeans and a T-shirt gets all the attention though. Sage words from the Dalai Lama of Dress. A good tailor can hide the excess, but at some point the jacket becomes unbuttoned, or the reach for something causes a “twist’ that reveals ones true physical condition. 2. “When you see a man and think they look good, chances are it’s 90 percent good looks and only 10 percent clothes. I would say “charisma” is the twin of that. Years ago, I had a girlfriend who had charisma in spades. On a couple of occasions we had returned from camping trips to drop in on parties that we were sorely under-dressed for. After being there for a half hour, I could look in the corner, and see her there, surrounded by several men, while dressed in her sweatpants. At the same time, the women who had dressed (even “overdressed”) for the occasion, where standing alone, or by themselves. I am certain, there is a male equivalent that fits the pattern. Inspiring, Simon. I’m starting my own. Were you walking up Vigo Street today around 14.30? I was on my way for a fitting at Poole. This is definitely ‘Z’ list! Why do people bother preaching their silly motifs?! Great rules, Simon, but I’d like to go back to one of your very early posts, which I think is also very important, in fact, something I think even more important, which is: the issue of fit vs. silhouette. I think all of us agree that fit is the most basic consideration above all else, but I think silhouette is in another sense even more important. I can imagine a jacket that fits according to all our known criteria, e.g., no bunching here and there, freedom of movement, collar stays on your neck, no curling of fabric on the upper back, etc., but the silhouette can be all wrong, either for you personally or for people in general (because tastes change, etc.). I’m entertaining myself by thinking of some 1970s Pierre Cardin piece of clothing that “fits” (shoulders right, armholes right, etc. ), but the sleeves are perhaps pirate-sleeves and all puffy — intentionally so by design — because that is the silhouette. And that can be all wrong for your body shape or aesthetic sensibilities…. Si, where do you stand on dyeing ones beard (or hair of one has it) in terms of adding to the sartorial package? Interesting post. 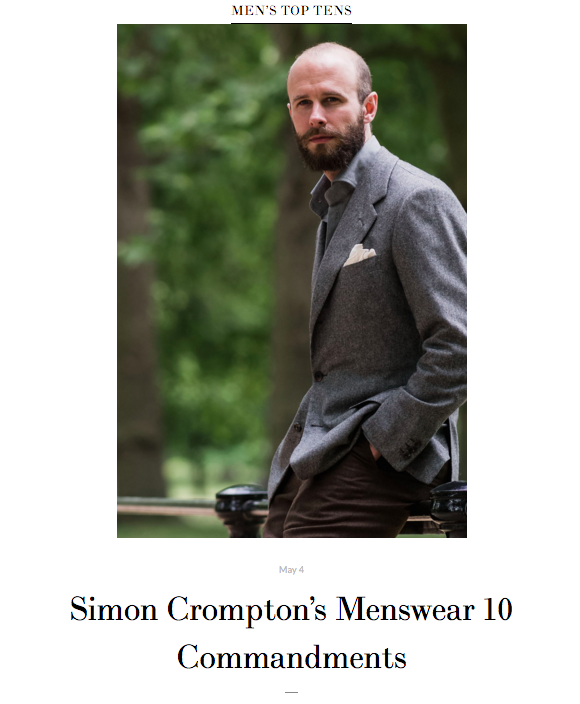 I enjoyed comparing your commandments against the sartorial commandments of Mr Francis Bown on his website. In summary, his are somewhat more prescriptive regarding the minutiae of bespoke, whereas yours gave better advice with regards to getting laid. Mon Dieu, I have to confess that these lists are the worst. Anybody nearing this sort of advice needs to start again at chapter one. I am not usually one to comment, but this is the worst. Look, the reason why I read this blog here is that I believe the content is interesting and even though almost every post features countless images of you, you somehow manage to *not* come off vain and self-indulgent. I have no clue how you do this, but it’s the single biggest reason I come back here. At the same time your advise is as they say actionable. Probably if I had no clue what kind of, say, shirts I should buy, if I browsed around your site for half an hour chances are I knew after. Or these lists, better, because they are all god awful. It starts with the absurdly pretentious title “10 commandments” — really? — and then offers a mix of the worst, the most shallow bourgeois bohème tips delivered in a patronizing insulting pretentious tone, even including made up quotes. This is Mens Health, GQ, etc. material. It is literally completely useless, silly, and insulting and everything that I dislike about fashion journalism . Thanks for your comments Christopher, particularly the fact that I don’t come across as vain. It’s always a fear. I agree with you on rules and particularly ‘commandments’ but then it’s not my site. Not the title I would choose. With ‘The Rake’ going down hill like a bob sleigh on the Cresta Run, it’s incredibly important that ‘Permanent Style’ remains a bastion of good taste. Always appreciate your work regardless of the frivolity of the company in which it is presented (i.e.another’s blog) but I do think you may be underestimating yourself with the notion that you wouldn’t dress the way you do if the majority of others did the same. My view is that you seem to be keenly appreciative of fine craftsmanship and thus would wear these items regardless, no? I think that’s a really interesting point, because dressing so that you emulate the look of somebody that you admire stylistically, or worse still that you wish you could be, must be a very lonely place to be. Dressing because it helps to reinforce who you are is the only way to go. The “get laid” comment certainly surprised me. It stands in contrast to your post “I am not a gentleman”. But then you were not writing for your own blog and the idea that paying attention to your date is more important than how you are dressed is right on the money.